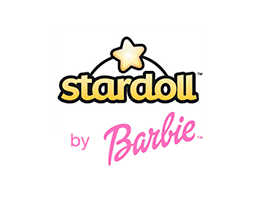 In February 2011 Stardoll announced a multi-year licensing agreement with Mattel. The partnership formed to take the Stardoll brand from the virtual world into real life with the first product line of dolls which came out in Autumn of 2011. 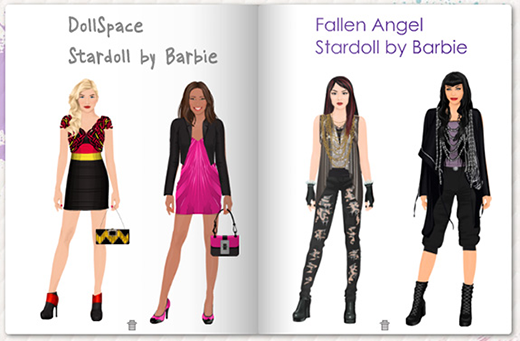 Stardoll by Barbie lets you experience all the online fun of Stardoll in the real world too. 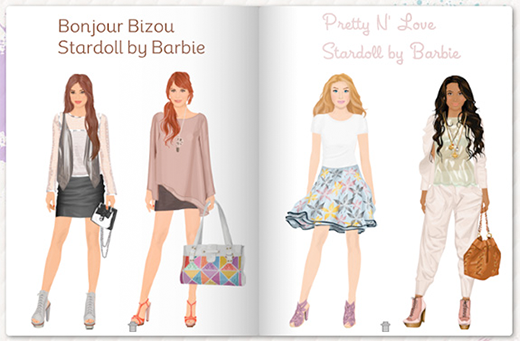 Play designer for your Stardoll by mixing and matching her fashions and accessories. This Barbie Stardoll Fallen Angel doll assortment case includes 6 individually packaged dolls. 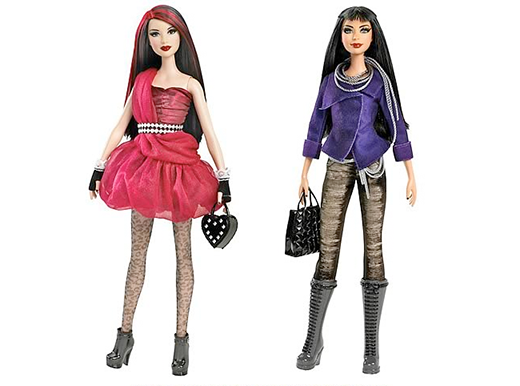 Goth style dolls with details like fingerless gloves and chain accents. Fallen Angel doll with trendy goth style in a maroon dress, black tights, and matching shoes. Her long raven hair features color streaks that match her dress. Fingerless gloves and bold makeup add to her daring look. Fallen Angel doll with trendy goth style in a deep-purple top, black pants, and chunky boots. She has long, lovely raven hair. Chain accents and bold makeup add to her daring look. 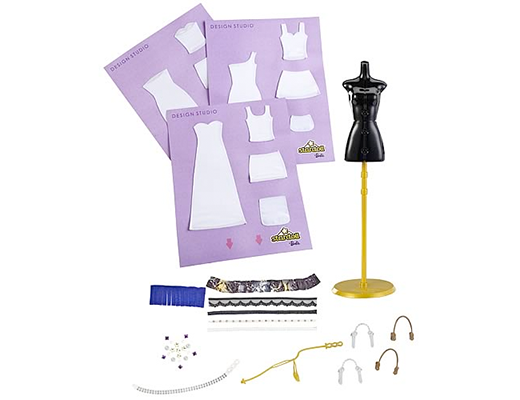 This Barbie Stardoll Bisou doll assortment case includes 6 individually packaged dolls. 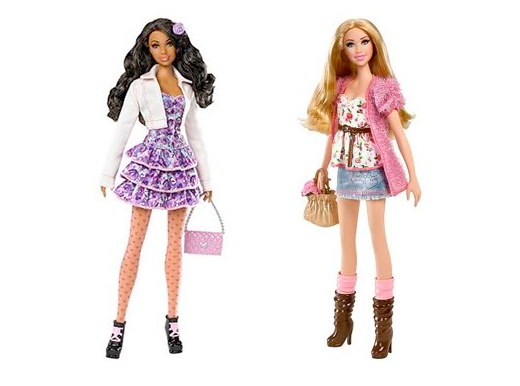 Eclectic style dolls with items like ankle boots and geometric patterns. Bisou doll with a striped jacket, graphic tee, denim shorts, black shoes, and knee-high tights. The matching purse has floral accents. Bisou doll with a shimmery jacket, gathered skirt, matching scarf, purse, and boots. 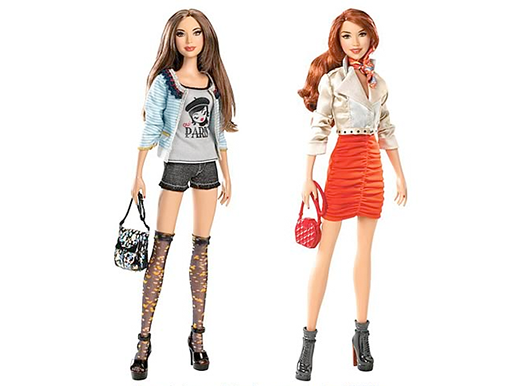 Doll features long, wavy auburn hair. "H♥rt Beat City" to "Sweet H♥rt City" and added a few more items. 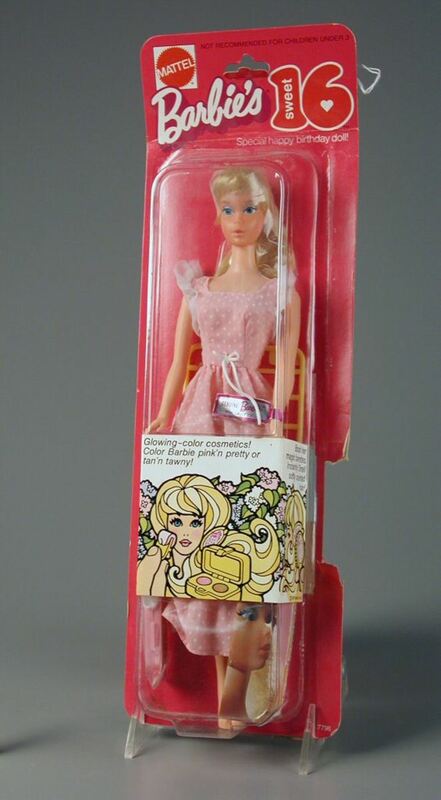 This Barbie Stardoll All Dolled Up doll assortment case includes 6 individually packaged dolls. 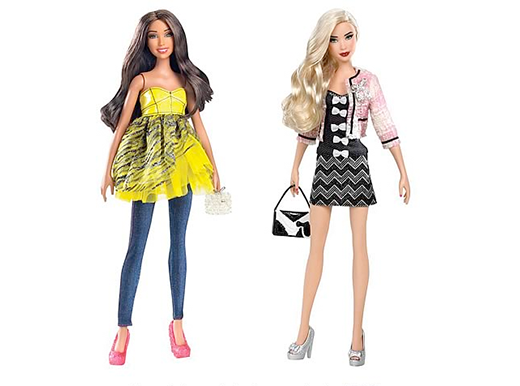 Girly style dolls with fashions like sparkly dresses, and glitter-encrusted shoes. Doll Space doll with a sparkly yellow skirt, denim leggings, and glitter-encrusted shoes. 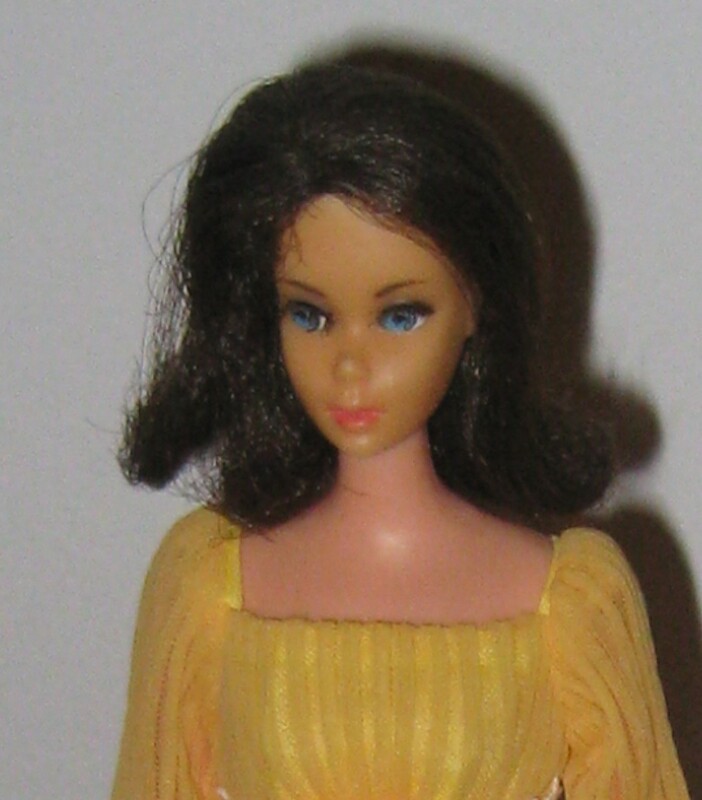 Doll has long, flowing brunette hair. Doll Space doll with a shimmery, bold-print skirt, pink tweed jacket, matching purse and shoes. 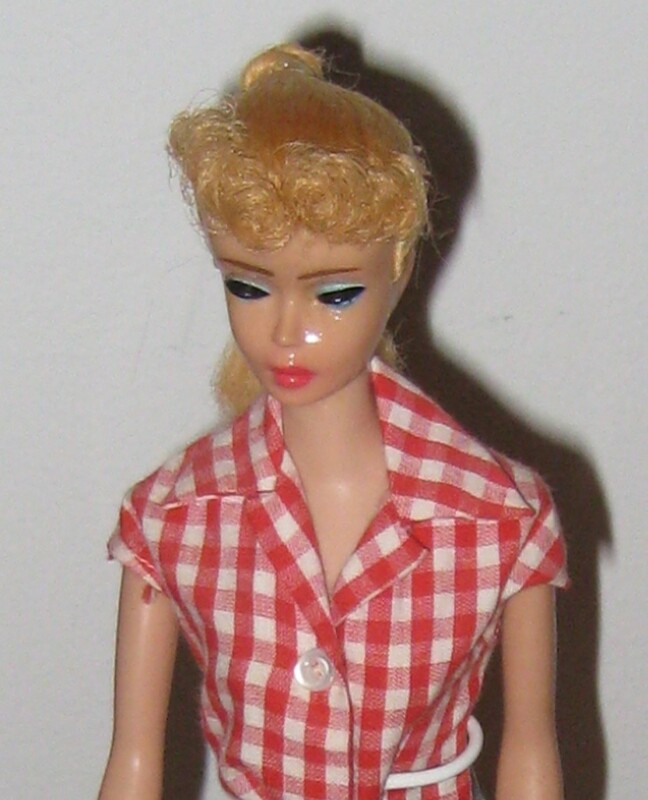 Doll has long, flowing blond hair. Sweet style dolls with fashions including denim, floral patterns, and boots. Pretty N' Love doll with a colorful ruffled dress, matching jacket, tights, flower hair accessory, shoes and purse. Doll has gorgeous, flowing black hair. Pretty N' Love doll with a pink top, denim mini skirt, belt, purse, and boots. 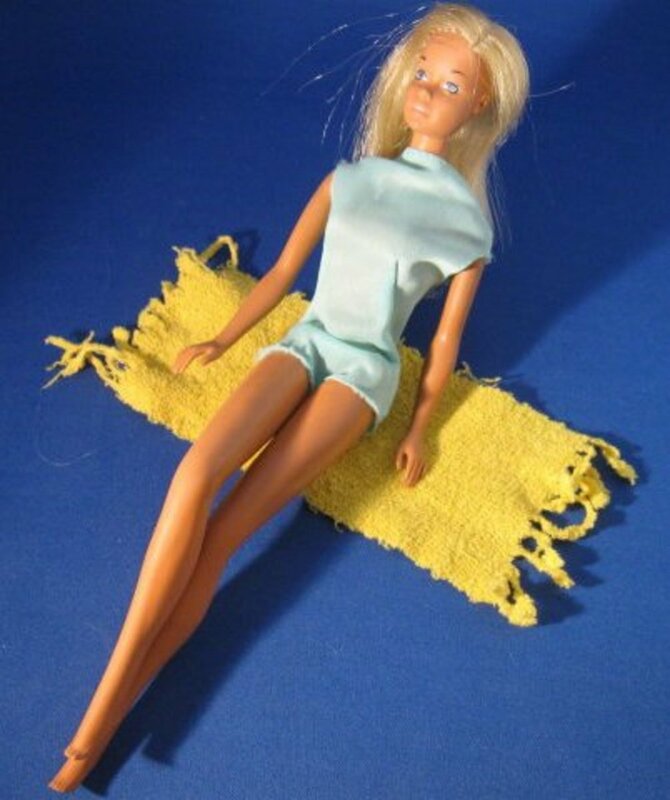 Doll has long, lustrous blond hair. 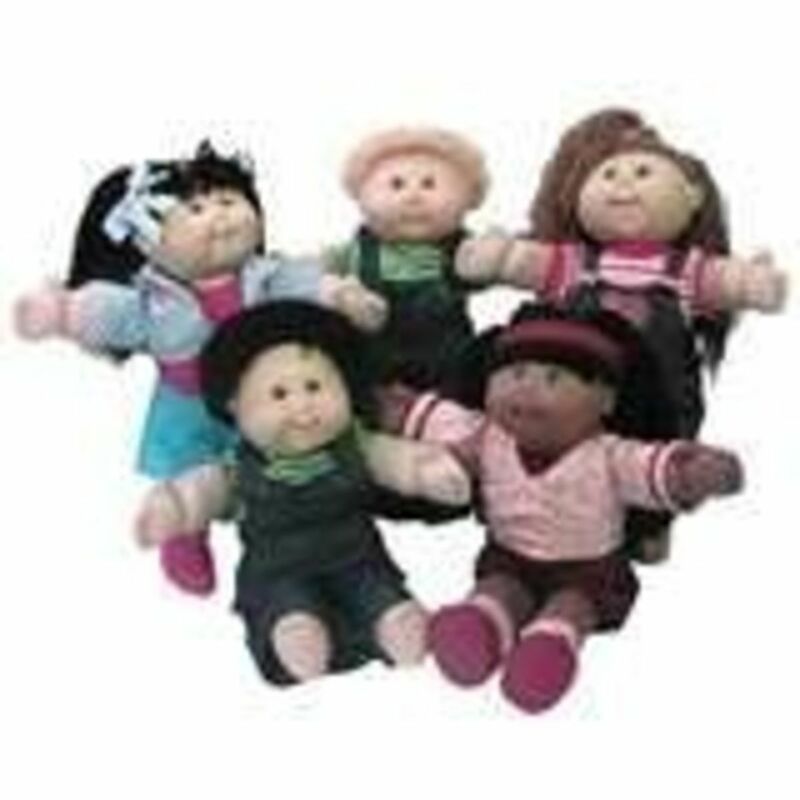 There are 8 different dolls pictured. "Stardoll is the world's most popular online community for teen and tween girls -- if you love shopping, fashion design, decorating and making new friends from everywhere you are already a Stardoll!" 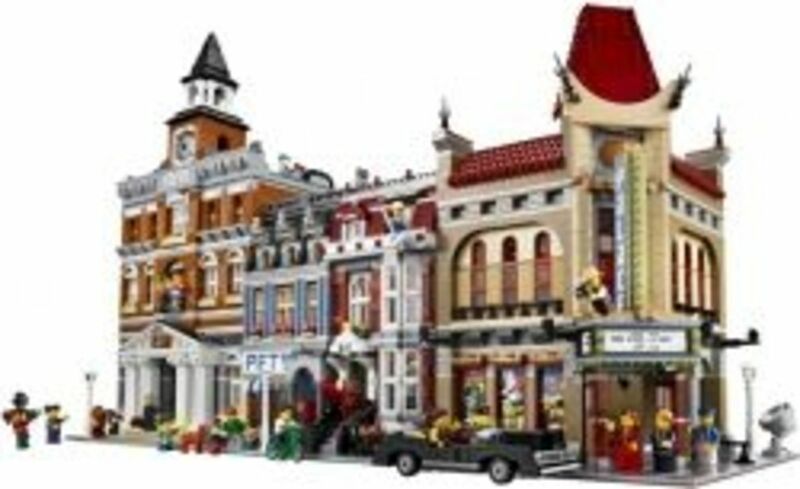 "Use your gift card code inside to unlock a one-week Superstar membership on the site with exclusive online content just for Stardoll by Barbie and go shopping in Starplaza with Stardollars, included!" Design fashions online at Stardoll then print them onto real fabric. Fit it onto the dress form to add embellishments like belts, fringe, and gems. December 30, 2011 was the Grand Opening of the NEW Stardoll by Barbie PALs store in Starplaza. You can buy any of the 8 virtual Pals for 20 Stardollars. If you sign up for Stardoll through the old Barbie Girls website you'll get a free Stardoll membership and tons of Barbie Girls fashions and accessories for your MeDoll to get you started. 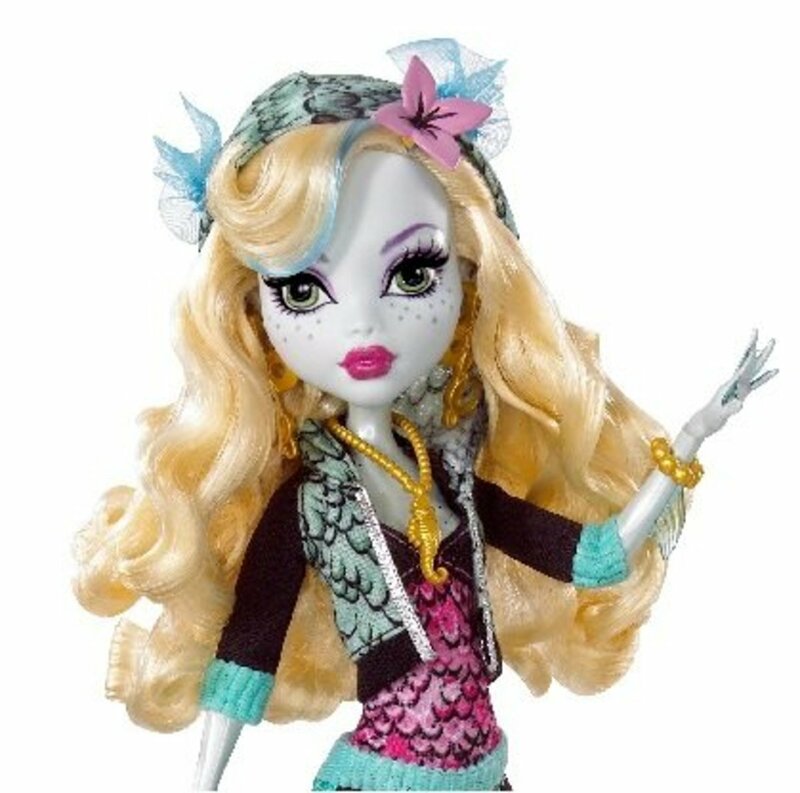 Choose a Nickname and Password and your ready to customize your online doll. Once you are in your suite you'll see boxes to open all filled with Barbie items! 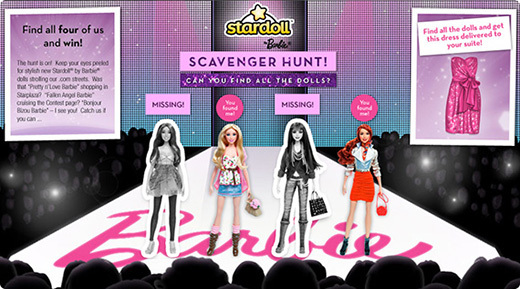 Four Stardolls by Barbie appeared on random pages of the Stardoll website. 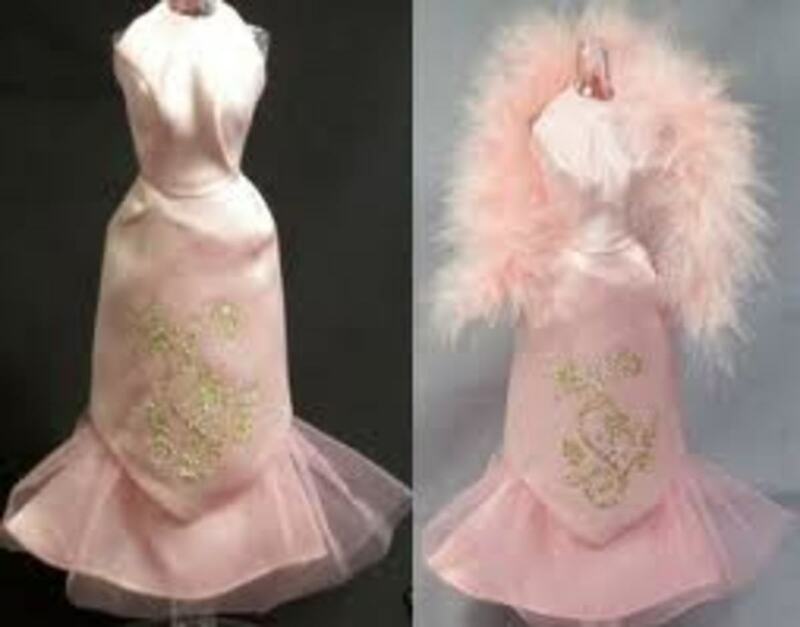 If you could find and click on, all four you were given a sparkling pink dress for your MeDoll. The dress looks nice with the shoes and bangle from the Free Barbie items. 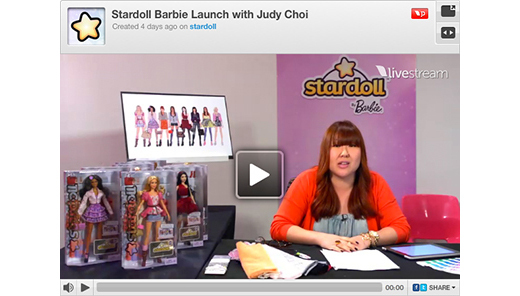 On Thursday January 26th Stardoll held a live video chat session with designer Judy Choi. You can watch it's recording at livestream.com. She confirms that there are more Stardoll Barbies in the works!